100% cotton high quality quilting, patchwork, craft and sewing fabric. 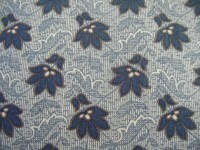 A lovely fabric in tones of blue and grey with a hit of brown - a fine little outline around the darker blue flower. Fabric has a fine tapestry look. From Marcus Fabrics "The Civil War Tribute Collection"